Just a minute ago I submitted my final exam for my very last class for my Master’s Degree! YAAAAY!!! (to be exclaimed with flailing arms all Kermit-the-Frog-style). I’m FREE! Well at least academically speaking. So let’s start tackling that “list,” shall we? Here is the long-awaited Pleated Pocket Tutorial. Now you too can make your very own and add it to everything: skirts, shirts, purses, baby dresses and more. This really is so simple. Enjoy! please do not take images from this tutorial without permission. thanks! Step 1: Press under 1/4″ along the bottom side of the top band (I did both sides but later realized I should have just done one). Step 2: Fold top part of pocket in half lengthwise. Step 3: With a 1/4″ seam allowance, sew around just two edges of the top band, the top edge and the side across from the fold (has been marked with purple in picture below). This will leave the bottom edge (the one you pressed) open. Step 5: Turn right-side out, poking the corners out with a tweezers or a pencil or some special thingamabob you purchased for this very purpose. Press. If you are smart you will also fold and press the raw bottom edges under along the folds you made in Step 1. Did I do this? NO. Dur! Now set this piece aside. 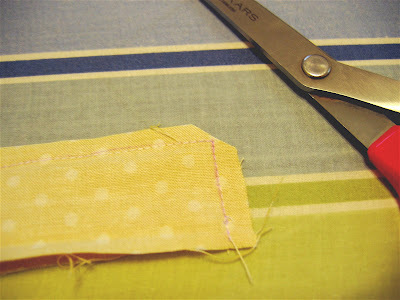 Step 7: Trim corners off with scissors and clip seams. Step 8: Turn right-side out and press. Step 9: Tuck bottom part of pocket into top band, making sure the folded edge of the top band is tucked inside, and pleating the bottom piece to taste*. I would tuck at least 1/2″ into the band. The size of the pleats will vary depending on how wide your top band is, but I would guess they will be about 1/2″ deep; adjust the size of the pleats so that the edges of the bottom piece fits exactly inside the top band. Pin pleats to secure. *Want the one you see in the picture? On the pink pockets I made two pleats facing out about 2″ from edge of pocket. 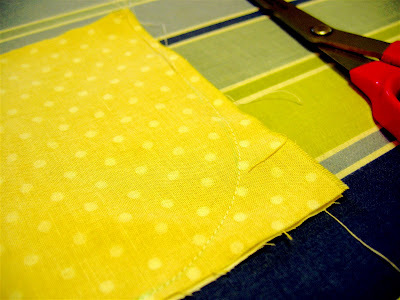 On the yellow pockets I made two pleats facing one way about an inch apart. For the bird pocket I put one large pleat in the center facing inward). One other thing here: I found that the pocket looks better when the corners of the bottom piece go farther into the top band than the center, so don’t feel like you need to make the edge of the bottom even with the edge of the top. If anything this will help your pocket pucker more. 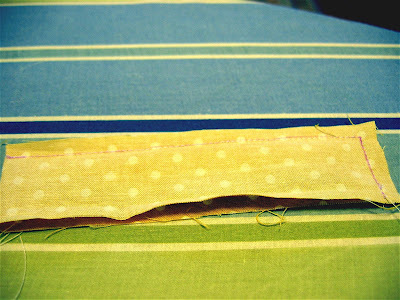 Step 10: With the pocket facing up, topstitch across the bottom of the top band to close everything up. The closer you are to the edge, the harder it is to “catch” both the top and bottom edges of the top band, so be careful. You may want to baste first with the back side up or do some extra pinning. I’m a glutton for punishment so I always just wing it and then end up inevitably tearing out the part I missed. Of course I remain graceful and dignified as I do so. Always. 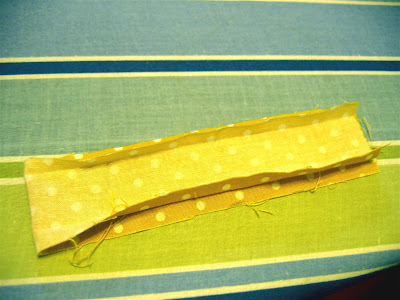 Notice that it looks a little uneven still; this will go away once you sew it to your garment. 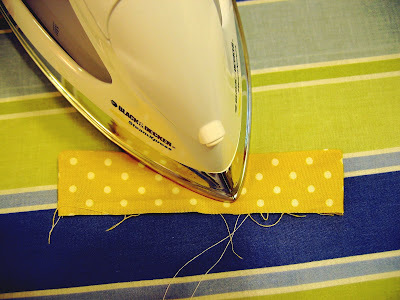 Remove pins, press it, pin to your garment and sew around the edges to secure. If you pin it so that the top band doesn’t lay completely flat against the garment, the pocket will have more of a rounded look and will pucker away from the garment somewhat. Congrats on finishing your Master's!! Yay!! Thank you – I have some aprons that are in need of fun pockets – this is perfect!! Thank you so much — my daughter (almost 2 years old) loves pockets! I look forward to adding some beautiful pleated ones to her clothes. Thank you Thank you Thank you!! And congrats on your Master's too, how exciting! I just finished the top you posted on Sew, Mama, Sew! and thought how nice it would look with some pleated pockets and decided I would wait until you did the tutorial so I didn't mess them up on my own. I just finished the top this weekend and now I can make my pockets; you have such wonderful timing :). I love seeing tutorials! Thanks. The pocket is a cute touch on garments! Great tutorial! 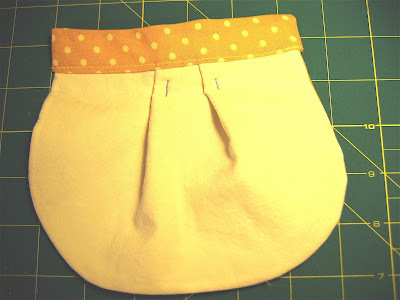 I was just thinking about what sort of pockets to put on my little princess's next skirt. Now I know!! felicidades!!! congratulations!!! and thanks so much for be so generous!! Yay, congrats! I love your new header btw! I love it! I just added a dress tutorial to my blog I may have to add the pockets when I get a chance and link to you! CONNNNGRATS! That's huge. REAL huge. And great tutorial. 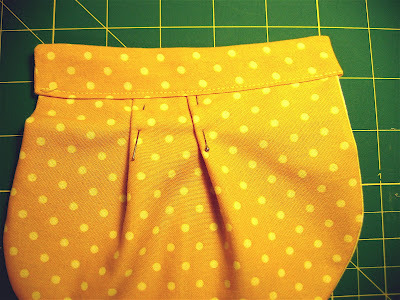 Funny thing, I'm working on my market skirt tutorial right now and it has a similar pocket. Maybe I should just link to your blog and skip that part :). And thanks for the pocket tutorial, I know I will be using it. You know you are SO awesome, right??!! Yay! Just yesterday I was wishing I knew how to do a pleated pocket! You are wonderful! And congrats on your Masters! Impressive. This tute looks great! I just cut out some shorts for Juliana and was thinking that I wanted to add a pocket. Now I what kind of pocket! I will let you know how it goes! Awesome! I want to try this out!! Congrats on finishing your Master's! I know that's such an awesome feeling! Thanks! These pockets are so cute! Thank you so much for this tutorial! the pocket is adorable and I can't wait to add it to a few projects. Congratulations on finishing your master's degree! Congratulations! I can imagine you feel very free! Those pockets are very cute. Thanks for sharing. Congratulations-that is such an amazing accomplishment! I love tute as well. I'll be linking! great tutorial!! now i just need to figure out what i want to put a pocket on! and congrats about grad school.. i remember how hard it was for me to stay motivated at the end so props to you! Congratulations on completing your Master's!!! Thanks for this helpful tutorial! My girls love pockets on their outfits and I would prefer if things didn't fall out of their pockets (as frequently happens with regular pockets). Oh, and a belated congratulations on finishing your master's! Know how you feel – I handed in my PhD thesis almost 3 yrs ago and I can still remember the relief/elation/freedom I felt. This was so easy to make! Thanks for this tutorial! I added a pleated pocket to a tote bag I embellished and I love how it turned out. Looking forward to making more. Thanks for the tutorial. It was really easy to follow and I'm so pleased with how it turned out. Kids can never have enough pockets. So I'm sure I'll use it again. for the top band – cut one rectangle 2" x 8 ½". For the pocket squares cut two pieces 4" x 5 ½". I would love to post a link to your Spring Ruffle Top tutorial on sewwhattoday.blogspot.com, on January 22! Do you mind if we use a picture of the shirt with the link? Congrats on finishing your masters, I know its 6 months late but I just read it. Thanks so much for your wonderful tutorial. It was so easy to follow and I LOVE the end result. 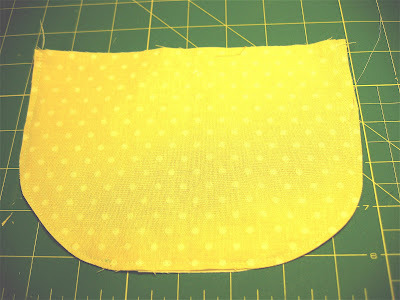 I have put a photo of my first pocket on my blog and linked back here. I hope you have a lovely weekend. I make such pockets in a slightly different way. I often make a pocket template from cardboard. I only cut out one pocket bag piece, not two, as you do. 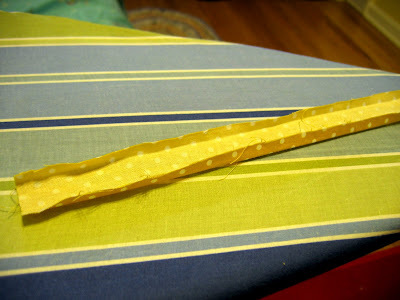 I sew a ruffling seam along the edges, then put the pocket onto the cardboard template. I do this on the ironing board. I then carefully pull the bobbin thread so that the bottom corners get slightly ruffled and simply folds themselves around the template. 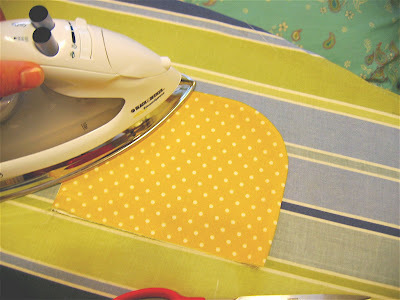 Then I use the iron on top of the template to press the edges, making them perfect and nice – completely even on both sides. After doing this, pleats and top band can be added if you want to (and eventually a top flap, if that is something you'd like). Then I just topstitch the pocket onto the garment. Oh, and yes, forgot one thing. I overcast the edges of the pocket first, since I have an overlocker, I normally use that one. 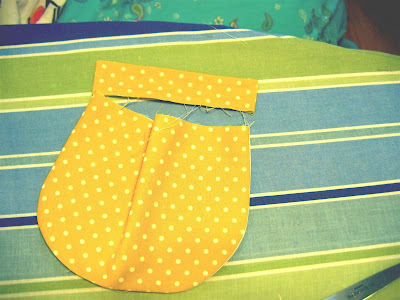 Making beautiful pockets using such a template, really is easy. It would have been great to have a set of pocket templates made from aluminum, just like my hem gauge which I just love and use all the time, it is just so easy and convenient to just fold the fabric over onto the aluminum template, it has marked different common hem allowances, so you just quickly fold it onto the right one, then press using your iron onto the template. You get crisp hems every time, it even seems that the aluminum makes pressing even more effective, probably because it gets real hot. If I don't stumle upon such templates (maybe they exist? ), I may try to get some made one day, at one of those local companies that sells brushed steel and such. 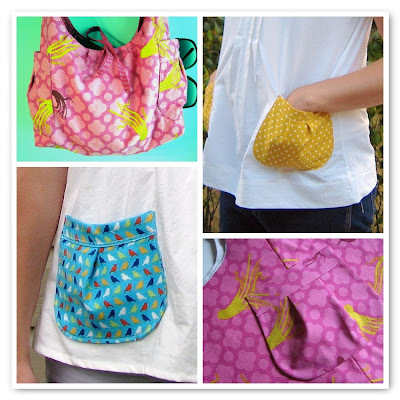 I love these pockets (and more to the point, so does my daughter!) The pleats make them so roomy AND cute. Just made a little jumper for my daughter with a pair of these pockets using wide ribbon to make the rectangle at the top, and I love the way they turned out! Take a look! Used your tutorial twice now. So easy! Thank you very much. Thanks for the fabulous tutorial. Hope you don’t mind, but I’m pinning this for future reference. how cool is it that when i search “pleated pocket tutorial” yours is the first to come up?! Awesome, these are just what my daughters’ skirts need! Congrats on your schooling. I am a Grandma and have encouraged, pushed,pulled and dragged my children and grandchildren to go for higher education. I may not know you personally but I am quite proud of you. congrats again. Thanks for the tutorial.